The cure for crow's feet. The skin around the eyes is naturally thinner, so it is inevitably among the first spots to show signs of wrinkling and age. An at-home alternative to doctor's injectables, this remarkable wrinkle remover fills in deep crow's feet, plumps lost volume under eyes and tightens sagging eyelids restoring smoother, thicker skin buoyant with youthful elasticity. 30-day regimen with results lasting up to three months. 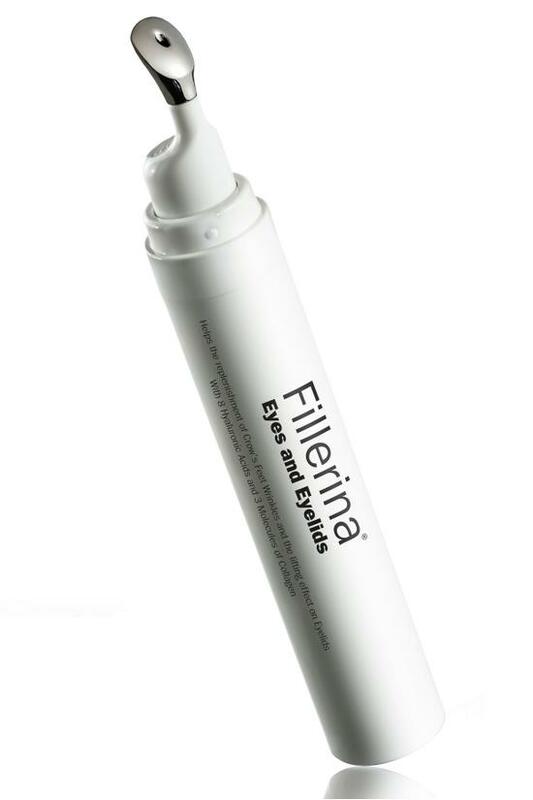 The special Fillerina Eyes and Eyelids finger-tip shaped applicator contains 15ml of Gel. To correctly spread the product, press gently the upper part of the applicator (for the first application, it is necessary to press repeatedly). Let a fair amount of gel exit from the tip, and spread a uniform layer all over the outer area of the right eye and on the eyelid by mean of the shaped tip. Do the same on the left side. Wait for 3 minutes, then complete the application by performing a gentle massage with the help of the shaped tip until the product has been completely absorbed. The product should be repeated twice a day, in the morning and in the evening. To enhance the preparation, it is possible to repeat the application more times a day. It is recommended to apply the product for at least 1 month and it can be repeated several times a year, for instance every 3 months. Aqua, Glycerin, Hydrolyzed Glycosaminoglycans, Sodium Hyaluronate, Caprylyl Glycol, Carbomer, 1,2-Hexanediol, Butylene Glycol, Sodium Hyaluronate Crosspolymer, Sodium Hydroxide, Pentylene Glycol, Hydrolyzed Hyaluronic Acid, Hyaluronic Acid, Hydroxypropyl Cyclodextrin, Hydrolyzed Collagen, Disodium EDTA, Hydrolyzed Sodium Hyaluronate, Soluble Collagen, Tropolone, Palmitoyl Tripeptide-38, Decylene Glycol, Acetyl Hexapeptide-37, Sodium Chondroitin Sulfate, Phenoxyethanol, Sodium Chloride, Ethylhexylglycerin, Sodium Benzoate, Sorbic Acid.